Festive and flavorful chicken and pineapple. Any night's a party when you cook up this Caribbean-inspired chicken recipe. Tip: Using your slow cooker frees you up in the kitchen- not to mention utilizing your Crock Pot makes energy efficient sense year round. Steve's been doing all the cooking of late. I know you know why, Babycakes. You're probably sick to death of hearing about it. But do you also know how ridiculous it is to wield a sharp knife and balance on crutches and pass the balsamic vinegar in a kitchen built (obviously) for one person who (also obviously) never cooked? All the bumping-bums while making sure your left foot is touching the floor at precisely (doctor's orders) no more than 25% of your total body weight- which, truth be told, Dear Reader, has blossomed by six- er- seven and a half pounds since you've been lounging in bed every morning past 10 o'clock, eating cinnamon-laced wedges of grilled cornbread and deep bowls of crunchy maple buckwheat flakes as you cruise your e-mail? That's right. I'm talkin' ridiculous. So we've been eating a lot of familiar recipes and not experimenting much. Experimentation needs elbow room. And stamina. Both seem to be in rather short supply here. Which led me to remember this terrific recipe from before my no-chicken, no coconut days. It disappeared from the blog for awhile (don't ask!). So I thought it might be time to bring it back. Here's a slow cooker recipe perfect for this time of year. Assemble it ahead of time and the house will smell so breezy-island fabulous you'll want to invite friends over to party. The word festive comes to mind. Drizzle a touch of olive oil in the bottom of the slow cooker . Rinse chicken breasts in cold water and pat dry. Place in the bottom of the slow cooker. Season with sea salt and ground pepper. Add the onion, garlic, red pepper, and pineapple chunks with juice. Add the broth, spices, and brown sugar or agave. Cover and cook on low or high- your choice- according to your slow cooker's instructions for cooking chicken and vegetables. 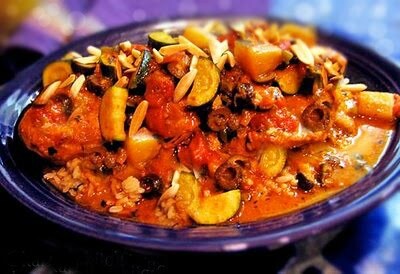 A half an hour before serving, add the coconut milk, sliced olives, and lime juice; stir a bit. Cover and heat through for 20 to 30 minutes. Serve- with all the broth- over hot cooked brown rice. I served this with Pomegranate Glazed Green Beans & Portobellos. Tasty. Serve topped with fresh chopped cilantro, if you like. Season this dish according to your own taste buds. I like to heat things up, so I use lots of spice. Oh man, I can't wait to try this! I think I may use thawed frozen tofu instead of the chicken, but that'll definitely be the only change. It looks great. Do you think I could pull it off in a pressure cooker? I'm currently sans slow cooker. These flavors would be fab with tofu. I wouldn't use a pressure cooker. I'd say, you have two choices- using a large heavy skillet or covered pot to slow simmer the ingredients for an hour- until the peppers, onion and squash are tender, or assembling it all in a large clay or baking dish and roasting it for an hour- till tender. In both cases, I would grill or brown the tofu first. Then add it to the pot/baking dish. Yum. Yum. Yum. I LOVE coconut and curry anything...I can't wait to try this. We are in need of some spicing up as we live in Wisconsin and the weather is sooooo dreary. I'm gonna put on some bright colors and bring on the spices baby, the hubby won't know what hit him! Thanks you for the wonderful recipe. P.S. Enjoy your new "girls"
thanks for sharing the recipe karina-- i tried it tonight for dinner. one question though- mine turned out white and yours was that rich orange/red color in the picture?? what was i missing? I use red curry- I wonder if that's it? I probably put paprika in as well (knowing me). I'll add those notes to the recipe. Thanks for reminding me of this one Karina - I've tried it before and think I will be making it again tonight. Until now I've just enjoyed your recipes 'cause they're yummy, not because I'm GF. However, we are trying to fix my man's health issues and are going to try GF and dairy free for the next month at least, so I'll be relying on you more than ever! Thanks for the constant inspiration! This ROCKED! I used frozen chicken breasts and cooked on low for about 7-8 hours and then added the coconut milk...SO good. We ate it like a soup, with just a bit of brown rice. K- I'm so glad. Hope your changes bring renewed health. Be well!